The Italian connection was undeniable in this concert of the Orchestre National de France at the Paris Théâtre des Champs Elysées, even if the “Italianness” was offered in various degrees -Tchaikovsky’s Romeo and Juliet by way of Shakespeare, Rachmaninoff’s homage to the great Italian violinist Paganini, and finally Respighi’s aural and visual impressions of Roman scenes. 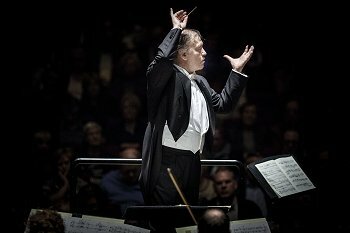 Categories: Concert reviews | Tags: Daniele Gatti, Khatia Buniatishvili, Marc Haegeman, Orchestre National de France, Ottorino Respighi, Paris, Piotr Ilyitch Tchaikovsky, Romeo and Juiet, Sergei, Sergei Rachmaninov, Théâtre des Champs-Elysées | Permalink. In spite of his gigantic recorded legacy Sviatoslav Richter left us relatively little Rachmaninoff. Of the famous concertos he only recorded the First and Second, and not even that many times. 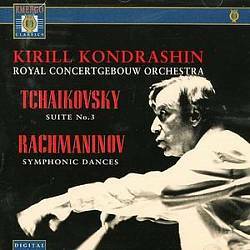 Hearing these Russian live documents from the 1950’s again, reissued by the Czech label Praga Digitals (the first in yet another “Richter Edition”), can but increase our regrets he didn’t return to them more often. 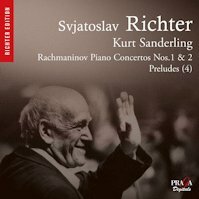 Categories: CD reviews | Tags: Kurt Sanderling, Leningrad Symphonic Orchestra, Marc Haegeman, Melodiya, Piano Concerto, Praga, SACD, Sergei Rachmaninoff, Sergei Rachmaninov, Sviatoslav Richter, USSR Radio and TV State Symphony Orchestra | Permalink. 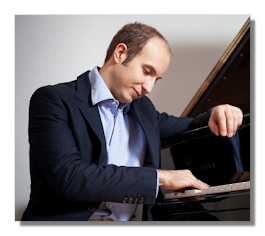 Vasily Petrenko and his Royal Liverpool Philharmonic Orchestra continue their cycle of Sergei Rachmaninoff’s orchestral works and concertos. Started on the Avie label (with the Isle of the Dead, the Symphonic Dances and the piano concertos featuring Simon Trpceski as soloist Avie AV2191 & AV2192), this new CD focuses on the 3rd Symphony and marks Petrenko’s debut on EMI Classics. Interestingly, the EMI disc was (partly) recorded at the same time – September 2009 – in the Liverpool Philharmonic Hall and produced by the same team as the older Avie CD already released in 2010. The transfer from an obscure to a more prestigious label reflects the success story of the award-winning young Russian conductor in another way. 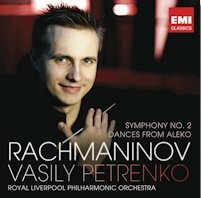 While one may still have to look for Vasily Petrenko’s name on the Avie CD cover, EMI generously gives him equal billing with Rachmaninoff. 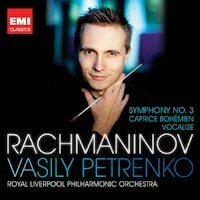 Categories: CD reviews | Tags: >Royal Liverpool Philharmonic Orchestra, EMI Classics, Marc Haegeman, Sergei Rachmaninoff, Sergei Rachmaninov, Vasily Petrenko, Vocalise | Permalink.